There are many advantages to planting nut trees in your landscape. Not only do these trees provide edible nuts, but nut trees are also beautiful and provide ample shade. Most of northeastern Kansas is classified as USDA Hardiness Zone 5b, with a very small portion designated as Zone 5a. In Zone 5a, the minimum average annual temperature is -15 to -20 degrees F; in Zone 5b, the minimum temperature is -10 to -15 degrees F.
Hardy in USDA Zones 3 through 7, the butternut tree (Juglans cinerea), also called the white walnut, is a slow-growing tree that reaches 40 to 60 feet tall with a 35- to 50-foot spread. In late October, the butternut tree produces 1 ½- to 2 ½-inch-long fruits covered in sticky hairs, inside of which are the oval nuts. The nuts are sweet and oily with a buttery flavor and are often used in baked goods. The butternut tree has distinct furrowed bark and compound leaves comprised of 11 to 19 leaflets that are dark green and slightly hairy. Plant the butternut tree in full sunlight and in nearly any type of soil. The Chinese chestnut tree (Castanea mollissima) grows best in Zones 4 through 8, so it will thrive in northeastern Kansas’s climate. Growing up to 60 feet tall and wide, the Chinese chestnut produces sweet, meaty nuts that are best for roasting and ripen in mid-September through October. This nut tree is resistant to chestnut blight and grows best in full sunlight and in acidic, well-draining loamy soils. You’ll need to plant at least two Chinese chestnut trees to ensure cross-pollination and nut production. The Chinese chestnut is also planted as a shade tree due to its wide canopy, and it blooms in pale yellow or cream flowers during early summer. Both the black walnut and Carpathian English walnut trees can grow in northeastern Kansas. The black walnut (Juglans nigra) grows best in full sunlight but can thrive in a wide range of soil types, reaching a mature height and spread of 50 to 75 feet. The black walnut tree has a low-branching but open and rounded crown. In early autumn, the black walnut produces green fleshy husks containing nuts with a rich, oily flavor. The biggest drawback to planting black walnut trees is that the roots contain a toxic substance that can poison certain types of plants, such as azaleas, rhododendrons, many kinds of vegetables, blueberry bushes and others. Growing up to 60 feet tall and wide, the Carpathian English walnut tree (Juglans regia ‘Carpathian’) has a shape similar to the black walnut tree and produces similar nuts, but it doesn’t have the same toxic substance in its roots. English walnuts have only half the protein content as black walnuts, however. 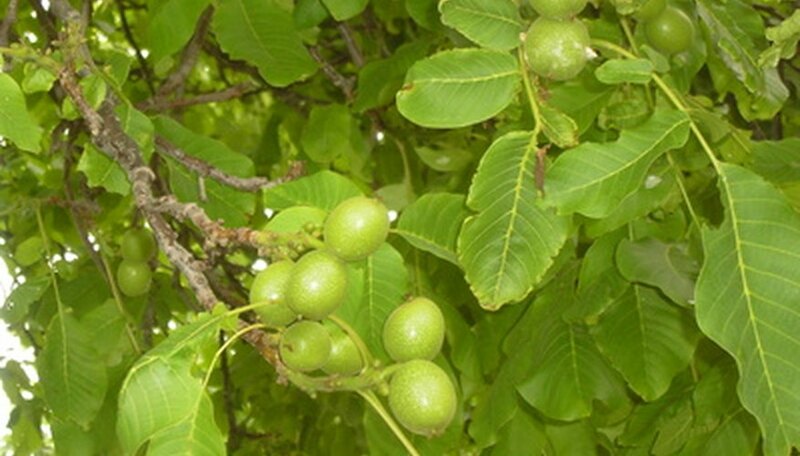 Plant the English walnut tree in full sunlight and in deep, light loamy soils but not in wet or poor soil. Although the English and black walnut trees are somewhat self-fertile, you should plant at least two walnut trees to ensure a good nut crop. The Hall’s hardy almond tree (Prunus dulcis) grows in USDA Hardiness Zones 5 through 8 and grows to only 15 or 20 feet tall and 10 to 15 feet wide. Its compact size and bittersweet almond nuts make the Hall’s hardy almond a versatile landscape tree for northeastern Kansas yards. The almonds mature during early September through October. 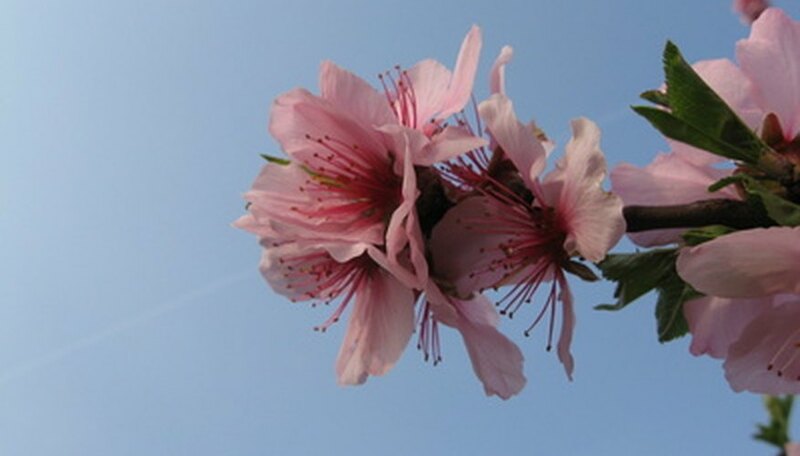 The Hall’s hardy almond tree also blooms during late spring in beautiful pale pink blossoms and has dark green, 3- to 6-inch-long leaves with finely-toothed edges. Plant at least two Hall’s hardy almond trees to ensure cross-pollination, selecting a planting location that’s in full sunlight and has well-draining soil. The shellbark hickory (Carya laciniosa) grows best in USDA Zones 5 through 8, reaching a height of 60 to 80 feet and a spread of 40 feet. This high-branching nut tree has a slender but sturdy trunk and an oblong, narrow canopy. The shellbark hickory produces large, sweet nuts in fall that are encased in an oval, ¼-inch-thick husk. The shellbark hickory is slow-growing, but it has attractive, shaggy bark and dark yellowish-green, 10- to 24-inch-long compound leaves comprised of five to nine leaflets. You can plant just one shellbark hickory tree, because these trees are self-pollinating. Plant your shellbark hickory tree in full sunlight and in nearly any type of soil.